This giveaway is sponsored by SunChips. I’ve always loved the BBQ flavor in chips. 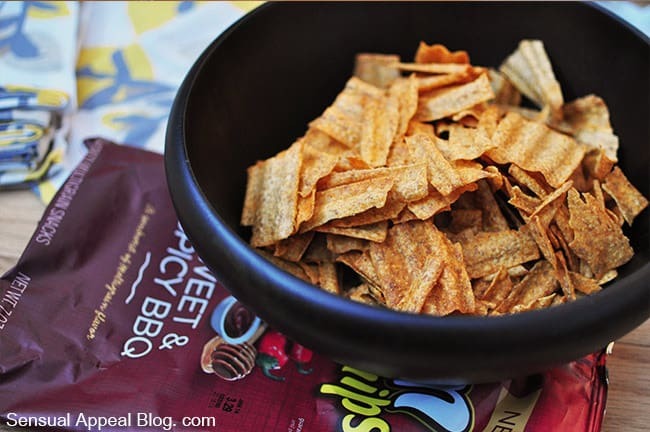 I’m not a huge chip eater since I’m more of a sweets type of girl, but I can’t usually say “no” to BBQ flavor.. especially when the BBQ flavor is spicy AND sweet.. it’s pure delight. I’ve always been a fan of SunChips and it seems to be the go-to chip brand for a side for lunch for my coworkers and friends. 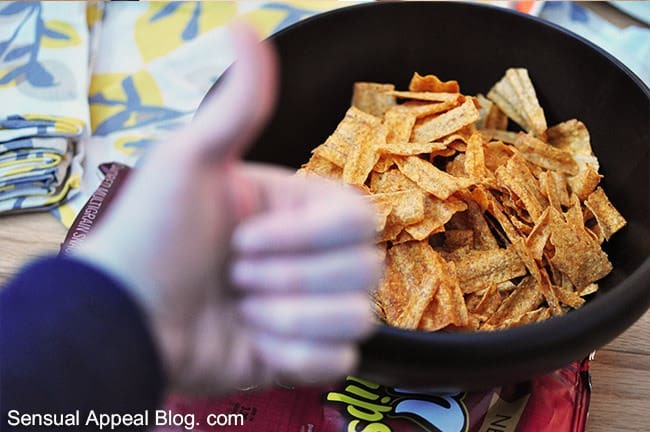 And no wonder – these chips are certainly much healthier than many alternatives as it seems to include all natural ingredients and the list is all readable ingredients. Plus the flavor.. the flavor.. is certainly anything but boring! Even my mom couldn’t stop eating them and she does NOT usually eat snacks like this. That’s gotta mean something, right? 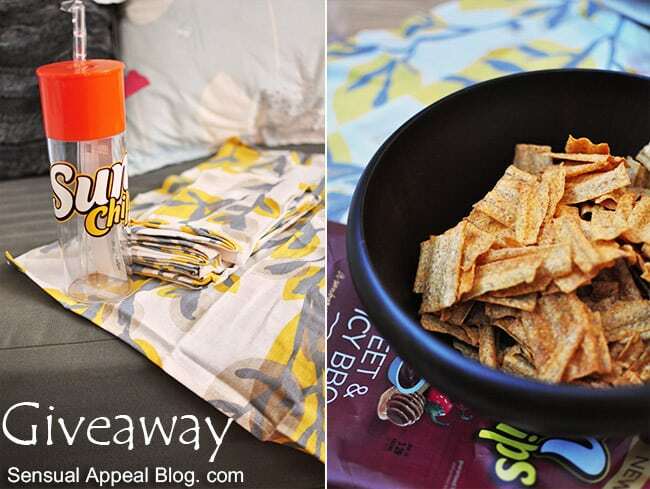 A large SunChips bag of their new flavor, Sweet & Spicy BBQ flavor chips… and a fabulous really high quality bowl you can serve the chips (or anything else) in – I really love this bowl! 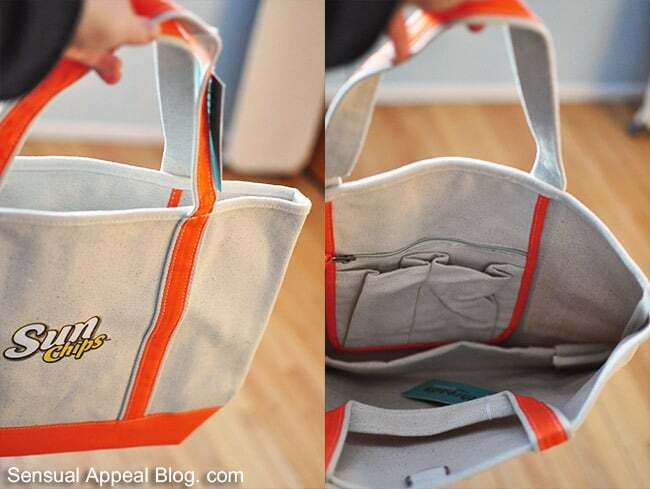 Also, a really cool and STURDY tote bag from Treads by Peerless – this is a legit bag and I can see it lasting many years, the quality is seriously great. 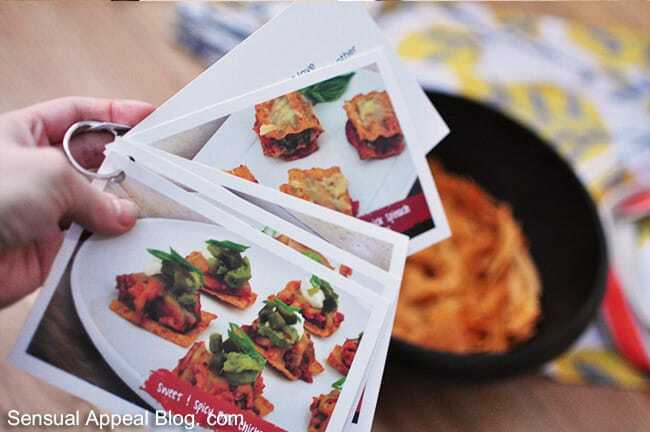 Also, a recipe book – you can get creative with SunChips! Also, a great and sturdy bottle and a set of bright and cheerful table cloths (pictured in the first image of the post as well). Now how awesome of a giveaway is this?? Yep. I think it rocks. My typical lunch includes a deli turkey sandwich with fresh tomato, avocado, cheese and spinach with a side of crackers or chips too! Thank you! Lunch is just about always a salad! I tend to go on the same kick, so I may eat the same salad everyday for a week. Normally it’s mixed greens with chicken, fruit and Italian dressing!! 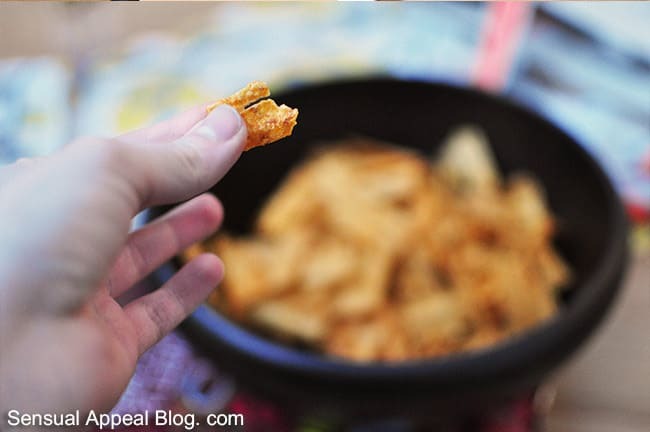 I usually make a salad for lunch like a chopped Caesar or Cobb and these chips would make tasty croutons on top! I eat gluten-free bread, avocado and hummus! These would be a perfect addition! 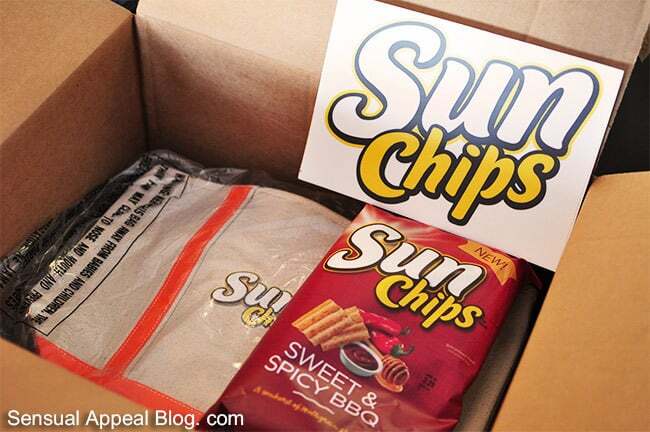 No sandwich is complete without chips and Sun Chips are a great side. I love a big salad with a variety of toppings – have one every day — if I miss at lunch i have for dinner! I always have a small bag of chips or crackers with my lunch. 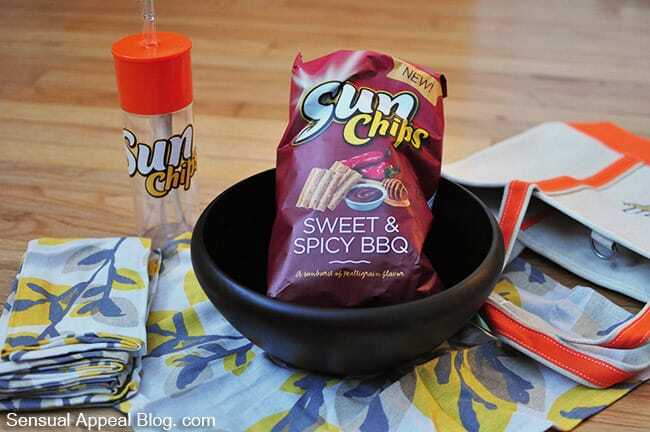 I might have to make those barbecue Sun Chips part of my lunch from now on! I usually bring fresh veggies, a greek yogurt, and a dish like a stir fry with chickpeas or other beans. 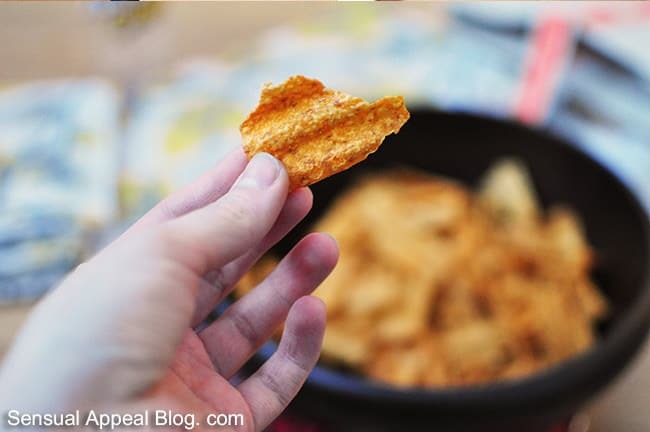 Sunchips are such a great snack! So cool that it comes with a recipe book too! 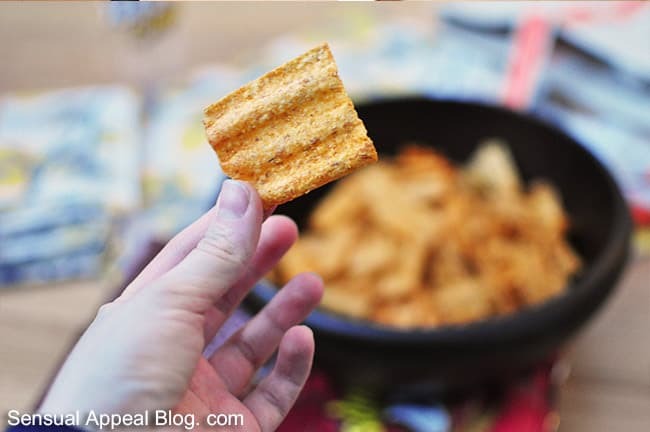 Mmmm Sun Chips, Triscuits, Wheat Thins – those all used to be my guilty pleasures… Alas, I can no longer eat them, lol! I usually have a sandwich and a piece of fruit. For lunch at work, I usually have an Amy’s Organic frozen dinner, with a piece of fruit. I love Sun Chips though. Thanks for hosting the giveaway! I usually have vegetarian meal that I have prepared, and if out of that, then I have an Amy’s meal or burrito. When I am working that is. Otherwise, i have a grilled cheese or veggies and dip with a protein of some sort. Lunch for me is usually a big salad and some yogurt. My husband loves Sun Chips. I usually eat salads for lunch and I haven’t had Sun Chips in a while. Can’t wait to try the new flavor! I usually have leftovers or a turkey sandwich. A sandwich or a wrap is a typical lunch for me with a side of chips of course! I usually eat leftovers from dinner from the night before for lunch. I hate to waste food, and it’s normally tastier the second day! i usually just eat leftovers. I usually make a toasted BLT sandwich. So yummy! I am at work during lunch so I eat a peanut butter and jelly sandwich for lunch every day. I don’t have access to a microwave or I would bring an occasional leftover, so it is just pb& j for me. I usually have a quinoa and bean bowl with lots of veggies and healthy fats. Either a baked potato or a salad. I try to have the salad more often than the potato. And one day a week, I go out for BBQ for lunch. Honestly I never have a set lunch! Most of the time its leftover, which varies. But I do have an emergency cup of macaroni and cheese at work if I don’t like what I’ve brought or I forget my lunch.